The Camino team’s new casual eatery specializes in salads and flatbread — oh, and kebabs. Grilled chicken is just one small part of this kebab plate. A few years ago, Russell Moore got the wild idea to make kebabs at Camino. It was p art of Camino’s more experimental, themed Monday suppers, and the kebabs turned out to be a hit. So, they got added to the special Monday night rotation, returning for a couple of months every year. The Kebabery with longtime Camino manager Brian Crookes and chef Traci Matsumoto-Esteban. Thanks to these splashy names, The Kebabery became an instant media darling, receiving months of constant buzz before opening. It’s understandable given Camino’s prominence in the East Bay dining landscape, but it’s also a little strange, given The Kebabery is such a simple little thing. The level of attention has even surprised Moore. “We’re not trying to be fancy,” he insisted. The menu is short — in a sense, only two items, plus mix-and-match options and sides. The space itself is small at 34 seats with counter-service and grab-your-own silverware. 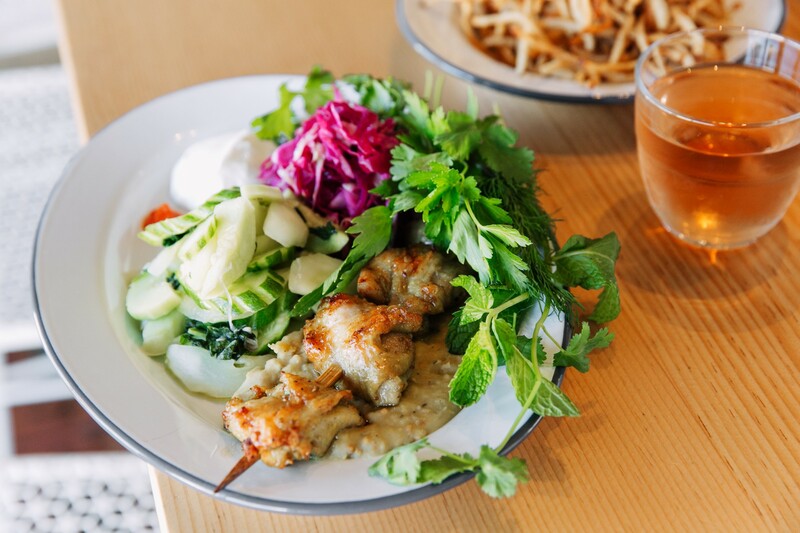 It feels like a prime lunch spot, but because of its location in the residential Longfellow neighborhood in North Oakland, The Kebabery only serves dinner. Your first decision: kebab plate or sandwich? The plate comes with flatbread and a couple of salads, while the sandwich comes with a salad tucked into the bread itself. so perfectly proportioned. The other factor is the stellar combination of herb jam, yogurt, and a fiery fermented hot sauce made from pickled chilies, which all gets spread onto grilled flatbread before the salad, kebab, and fresh herbs are loaded on top. The bread, inspired by traditional Middle Eastern flatbreads as well as Tartine Bakery’s Chad Robertson, gets its earthy flavor from whole grains and light sponginess from a slow, natural leavening process. It’s far more memorable than pita. Of the salad options, I liked the sauerkraut — a lightly fermented, still-crunchy, and wholeheartedly non-traditional version made with purple cabbage — and tangy cucumber as sandwich fillings for their textural heft. Of the kebabs, there are no losers. 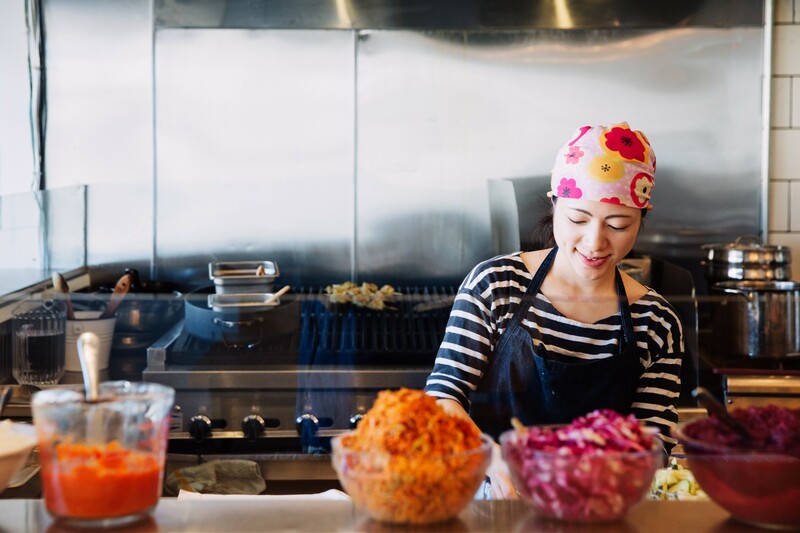 Executive chef Traci Matsumoto-Esteban works the grill and assembly line. Maybe it seems weird to wait this long to address the kebabs at a kebab restaurant. But even Moore thinks of the kebabs as secondary. A gluten-free, vegan feast might look like spiced and grilled king trumpet mushrooms, served with mashed beets and red lentils, a carrot salad, and a bushel of fresh herbs. Even as an omnivore, I enjoyed this meal, though I found the beets and carrots a little lackluster on their own. Swirling everything together with herbs and hot sauce helped. If it seems like I’m over-emphasizing herbs here, it’s because they do take up a significant portion of the plate. The mix is more interesting than you’d expect, too: perilla, shiso, and lovage might appear alongside the more typical mint, parsley, and dill. For Moore, this is a big selling point for kebabs. He loves any meal that comes with a pile of herbs. It’s really less about the thing-on-a-stick than his preference for lots of small salads and herbs, served with a piece of warm bread. After my meals at The Kebabery, I felt great. I felt light. The portion size, which will probably seem small to big eaters, and amount of vegetables made me feel like I was doing my body a huge favor. I didn’t feel chia seed-level virtuous, but like this was the sort of food I could and should eat on a regular basis. Anyway, now I will finally talk about the kebabs. You can choose between two meat options or the aforementioned mushrooms. The lamb is prepared kefta-style, with ground meat and flecks of herbs. Matsumoto-Esteban is a master on the grill, and these kebabs come out moist and tender, if a little subtle in flavor. I preferred the chicken, which is boldly seasoned with fenugreek, turmeric, ginger, and garlic. The thigh skins are left on for a lovely, crispy exterior, and the meat is as juicy as you could hope. These are a far cry from the dry, overcooked kebabs of your nightmares. Business model-wise, The Kebabery isn’t exactly standard, either. The meats, produce, spices, yogurt — even the three wines on offer — are all organic. These are Camino people, after all. And like Camino, the prices are inclusive of service, meaning you don’t have to think about tipping. In turn, the pay scale for The Kebabery’s staff is the same regardless of being front or back of the house. “No one gets paid fantastically, but no one gets minimum wage, either,” Moore explained. Taken together, this explains the potentially eyebrow-raising $15 for a single kebab, piece of bread and two small salads. For folks in the neighborhood wanting to dine on the regular, Moore created the Longfellow Special, a combo of soup, salad, and bread for $10. The soup changes, but it’s supposed to always be legume-rich and filling. On my visit, it was a hearty mix of just-cooked garbanzos, greens, mushrooms, and tomatoes, sprinkled with fried cumin and mustard seeds. A generous spoonful of yogurt added richness. If you’re still hungry, you will not regret sharing a mound of well-seasoned shoestring fries for the table. Filled with natural light, The Kebabery sports a minimalist, low-key look — all white walls, white tiles, and pale wood. Single-tier, white versions of Camino’s distinctive chandeliers hang in the center of the room. Hip wooden chairs were designed by California College of the Arts students. In the future, Moore wants to add breakfast — probably of the quick, flatbread-labneh-egg variety — along with a long-discussed kebab option of Indian pakora-style fried vegetables. It’s worth contemplating these nontraditional efforts at the counter, warmed by the open-fire grill and the knowledge that the dishwasher is making a living wage.